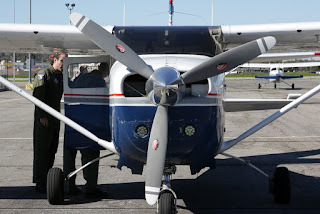 As part of the statement of mutual support, Civil Air Patrol is giving AFA members who “opt in” two years of free enrollment in its Friends of CAP program, which offers interested individuals a way to stay connected with CAP without the obligations or commitments involved with regular membership. As a Friend of CAP, AFA members will also receive an electronic subscription to Civil Air Patrol Volunteermagazine and an invitation to visit a local CAP squadron or special CAP event. Congratulations to New Group 7 Commander Maj. Craig Newton! 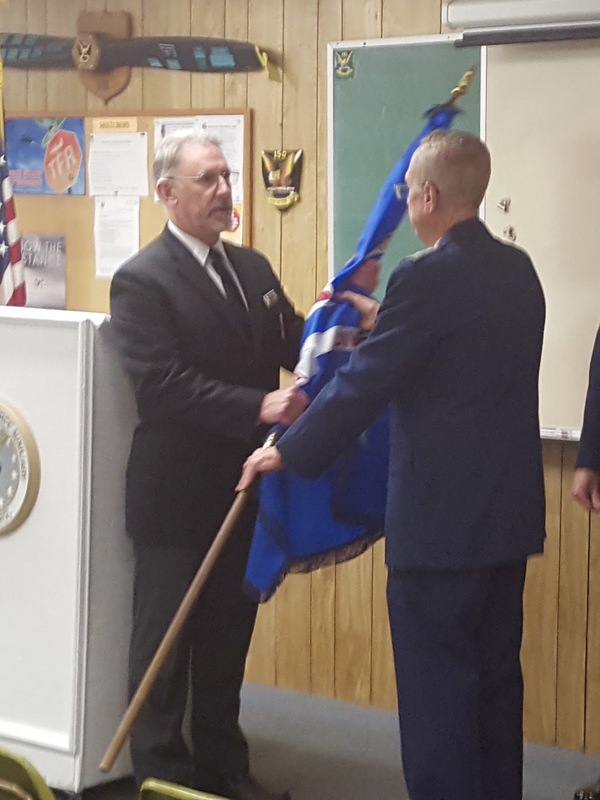 Maj. Craig Newton assumed command of Civil Air Patrol (CAP) South Coast Group 7 during a change of command ceremony held at South Coast Group 7 headquarters at Los Alamitos Joint Forces Training Base on 8 January, 2018. CAP California Wing Commander Col. Alan Ferguson presided over the time-honored ceremony signifying the transfer of authority from one commander to another, as he received the South Coast Group 7 flag from outgoing Commander Lt. Col. James Robertson and handed it to Major Newton. Also representing California Wing at the ceremony was Vice Commander Lt. Col. Gregory Chase. During his final remarks as Group 7 Commander Lieutenant Colonel Robertson said, "Major Newton is highly respected within Civil Air Patrol. He is one of the most prepared people to assume command of this Group." Major Newton joined Civil Air Patrol in December 2011. "When looking at my wife's singing schedule (who is a professional opera singer) in the upcoming year, we realized that she was going to be very busy. She jokingly told me that I needed to get a hobby. I had been looking at joining CAP and the rest, as they say, is history." 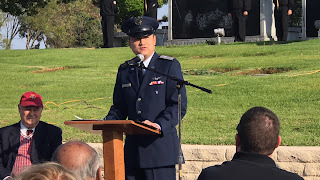 Prior to his appointment as South Coast Group 7 commander Newton served as the squadron commander for Falcon Senior Squadron 40, based at Fullerton Municipal Airport. He holds numerous emergency services qualifications including Mission Pilot, Airborne Photographer, Air Operations Branch Director, Incident Commander 3 (Trainee), and Senior Flight Release Officer. He is also serves as the assistant Inspector General for California Wing. When asked what he is looking most forward to in his new role as South Coast Group 7 Commander Newton said, "I enjoy meeting new people and interacting with them. I hope to give the members of Group 7 the knowledge to succeed; I hope to do this by selecting my staff of experts, that can be called upon as mentors." 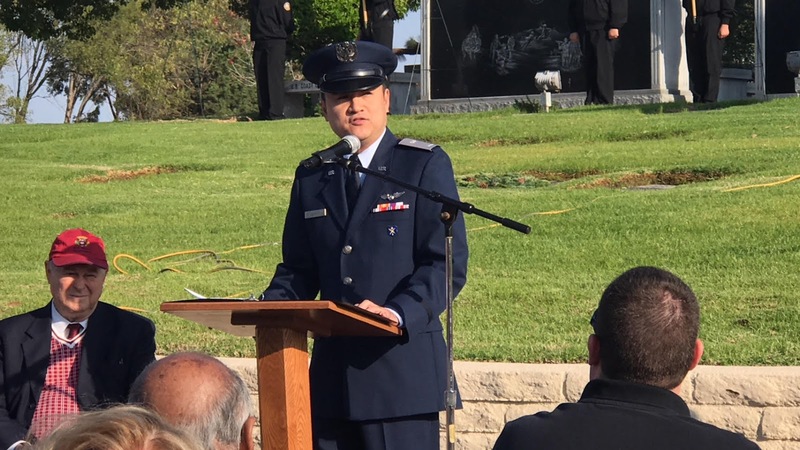 Squadron 150's Deputy Commander, 1st Lt. Rommel Anacan was asked to say a few words at the Wreaths Across America ceremonies conducted at Pacific View Memorial Park in Corona Del Mar on 17 December, 2017. Also speaking at the event were Gold Star Wife Linda Walters and U.S. Representative Dana Rohrabacher. 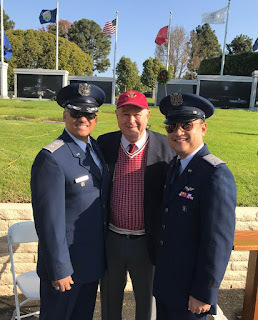 After the ceremony 1st Lieutenant Anacan and South Coast Group 7 Professional Development Officer (and former Squadron 150 Commander) Maj. Lloyd Bumanglag had an opportunity to speak with Representative Rohrabacher (who voiced his support of Civil Air Patrol) and take a picture with him. 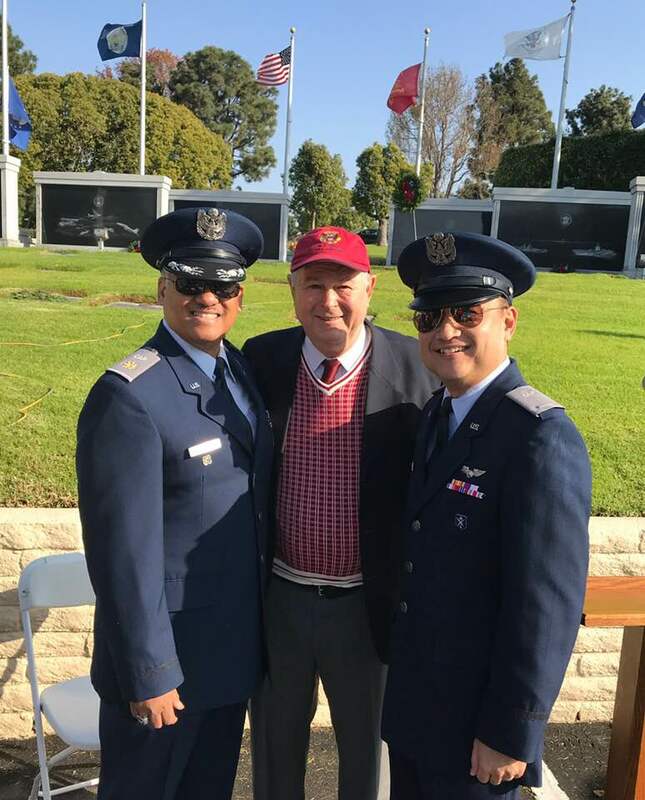 It was an honor for our squadron and Group 7 to participate in Wreaths Across America ceremonies throughout the area and our thanks to Marie Hess (the organizer of the event at Pacific View), to all of the volunteers that participated and to everyone that sponsored wreaths this year. Congratulations to our newest 2nd Lieutenant! 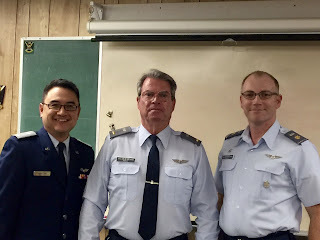 Long Beach Senior Squadron 150 is pleased to announce the promotion of SM Craig Roalf to the grade of 2nd Lieutenant in the Civil Air Patrol. 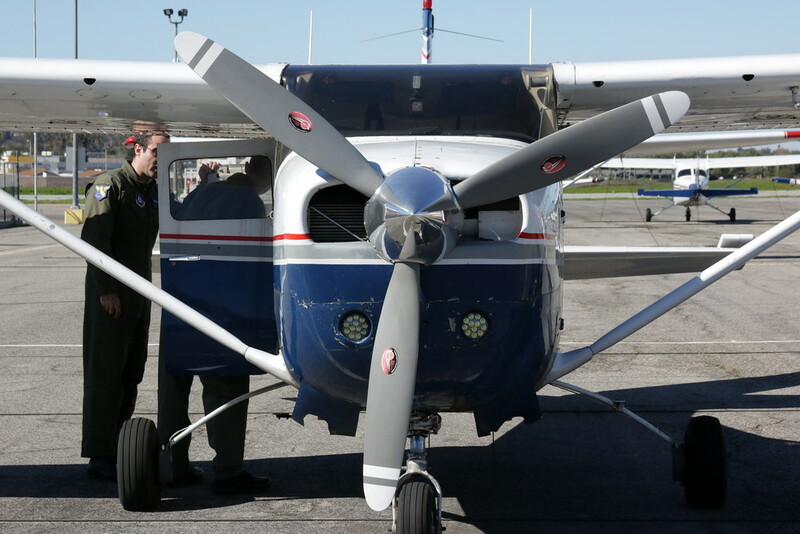 Roalf joined Civil Air Patrol in June 2017 out of a desire "to use my interest and knowledge in aviation to further the means, methods and ability to serve my country." Roalf currently serves as an Assistant Emergency Services Officer, is a Mission Scanner and is a Mission Observer trainee. He says that, "As a member of CAP my favorite aspect is having the ability to acquire life-saving knowledge and skills." "2nd Lieutenant Roalf has made a positive impact on Squadron 150 since joining in June 2017" said 1st Lt. Rommel Anacan, Squadron 150's Deputy Commander. 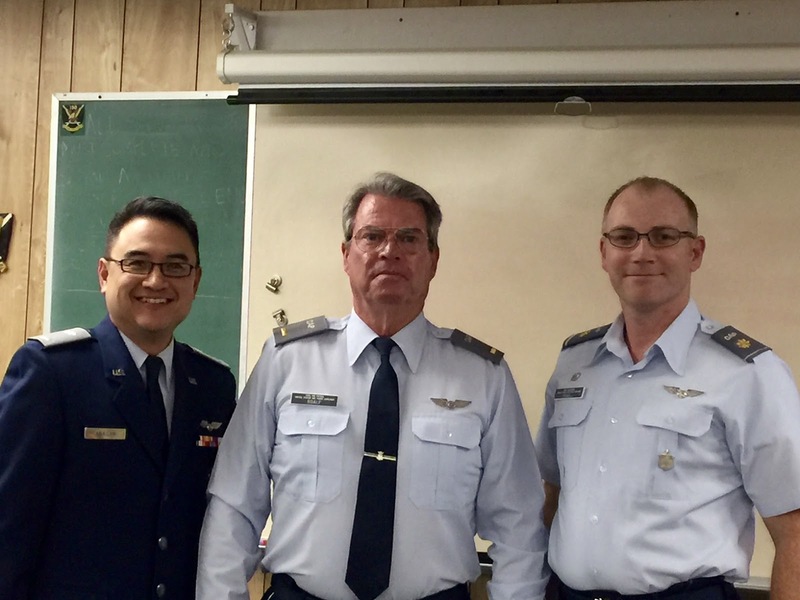 "He was instrumental in the success of Civil Air Patrol's role at the 2017 Huntington Beach Airshow-and he has already become qualified in an emergency services role in such a short period of time. 2nd Lieutenant Roalf is a tremendous asset and his promotion is well deserved." Join us this week for the first meeting of 2018! Happy New Year, everyone! 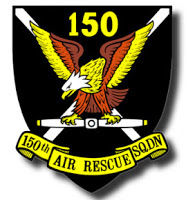 Squadron 150 will resume our regular meeting schedule this week with our monthly Safety Briefing on 4 January, 2018 beginning at 1930 (7:30pm). The topic is Aircraft Ground Handling and Safety. For new and prospective aircrew members this will be great information-and for experienced pilots and aircrew members, it will serve as a good refresher course. Members needing Aircraft Ground Handling and Safety currency: You will have an opportunity to watch the CAP video on the topic and then take the online test. Members working towards Mission Scanner qualifications please review Task O-2015 Demonstrate Ground Operations and Safety in the Aircrew and Flightline Task Guide prior to the meeting. You'll be given an opportunity to review the content with a Skills Evaluator and get that "signed off" on your Mission Scanner specialty qualification training record. With Search and Rescue Training Exercises beginning in full force, we want to help members interested in Emergency Services roles get qualified as soon as possible!